Three of my favourite outfits this month. The first consisting of old trusted items, number two a brand new dress, and number three a UFO finished a year after it was started. I am pretty sure that most of us who have been part of a Me Made- challenge at some point has experienced something similar. It really makes you stop to think about the things you make. What is so great is that you can tailor your own challenge to fit your current situations. This way there is always something to learn! 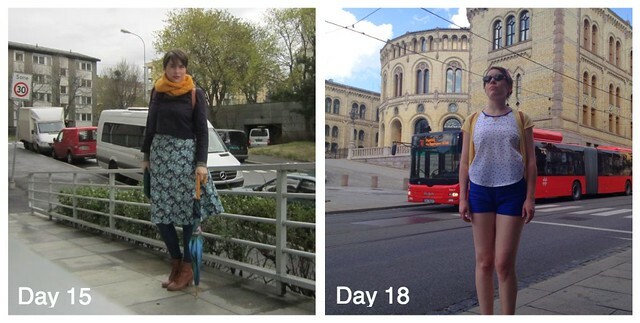 This year my challenge is to wear different outfits each day – it´s a way to force myself to wear items that not always gets worn as much as others. The contrasts in temperature illustrated by days 15 and 18. To keep track of what I actually own, I made a list just before the month started, listing all items I have made that are spring/summer appropriate. Every now and then I have checked back with this list, to see if I am missing something.I have tried to have a good blend of trousers, skirts and dresses. And if I wear more than one outfit each day, I try to document that as well. 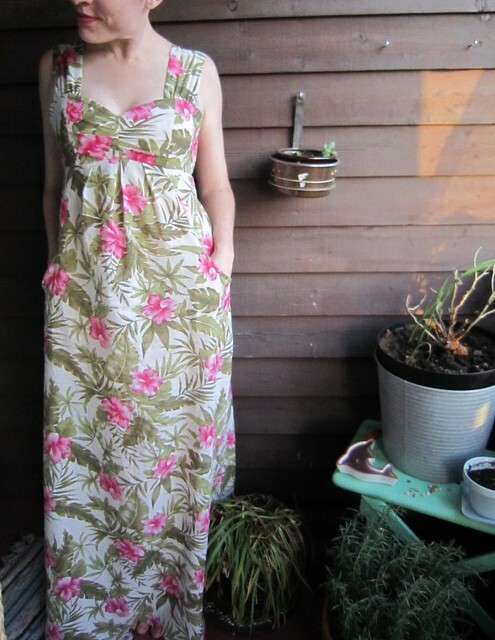 A dress made during May. I am very happy that I made the list, because I am a little bit absent-minded and I am known to forget the strangest things (like for instance pieces of clothing I have made myself…). So every once in a while, I have checked my list and thought: “Oh, right! I have that dress too!”. Another challenge this year is to compose outfits inspired by other participants Every year I see the most wonderful outfits that Me-Made-ers wear, but I tend to forget again quite soon (ref. last paragraph…). So this year I have marked many more outfits as favorites in the Flickr- group. That way the inspiration is still there, even if May is over! I have even ordered some patterns I found particularly inspiring, and will buy a couple more next month too (Renfiew, Banksia and Darling Ranges I am looking at you all…). One thing I am quite happy about is that there are some of my me-made garments from way back, that are still going strong. 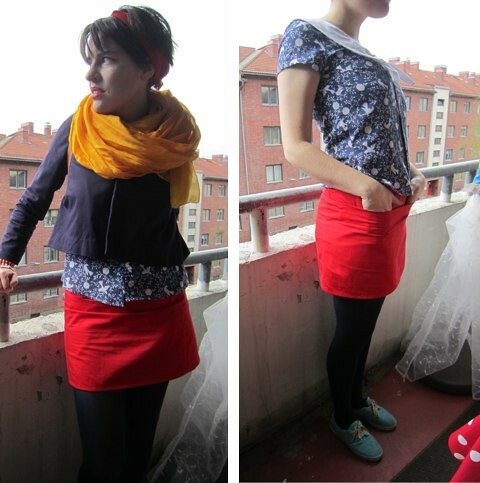 I make new things every year, and I give away me-mades I just don´t wear every year too, but there are some items that aren´t leaving my wardrobe any time soon. I thought it was fun to put together some pics of items that´s been with me through more than two challenges, and what I love about them. 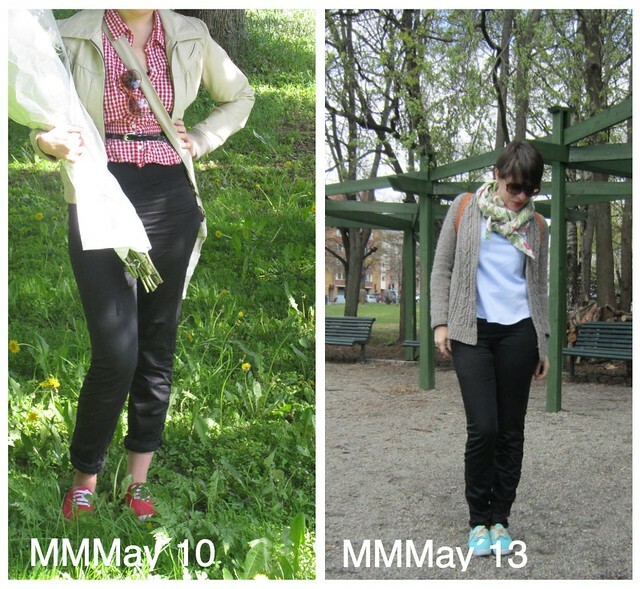 One of my oldest makes, the black trousers – still going strong! The last thing I want to reflect on is that MMM always seem to have a wonderful effect on my sewing mojo. Because of all the inspiration of others, and because I take a more critical look at what I own, the me-made months are always full of new creations. I hope I haven´t bored you to much with all of this, but I find it is a great way to be reflecting on my own sewing process. How about you? 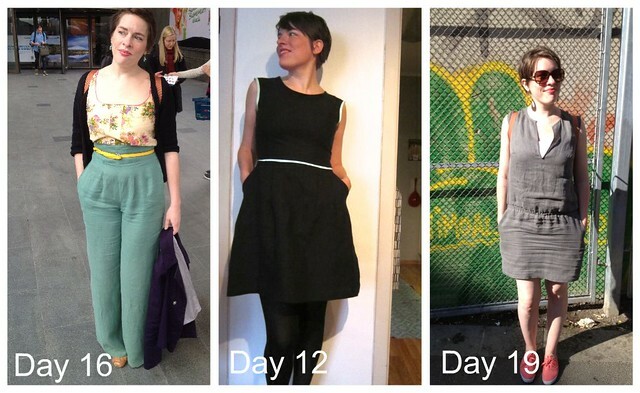 Are you learning something new about your own sewing from taking part of challenges like Me Made May? Thanks for sharing a couple of pieces from the archives that are still getting a good run. MMM definitely helps the sew jo doesn’t it! This is only my second one, but for me, I’m so happy to see that things I wore last year are still in the mix this year. 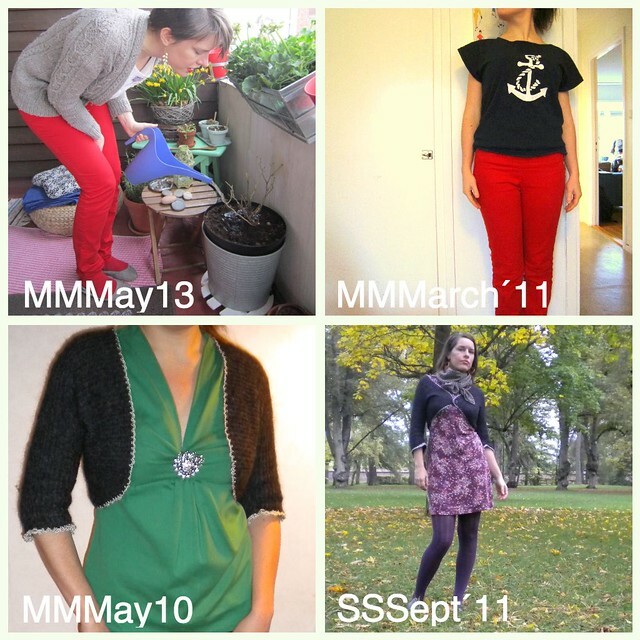 I haven’t participated this year but I think it’s great the way MMM makes us think about what we’ve made and gets us wearing the lesser worn items. Also how some things have been really great wardrobe pieces that have been loved and lasted through many years. Great idea on the list making, never would have thought of that. making a list sounds like a good idea, i had my memades hung in wardrobe together with non memades shoved down to back where i couldn’t see them!